I've read many different articles about the strength difference between the original ACL, the patellar tendon autograft and the hamstring autograft. Some say the patellar tendon is the gold standard because it is the strongest, whereas others say the hamstring autograft is twice as strong as the original acl and 1.3 times (or something) as strong as the patellar tendon. "Recalling that a normal ACL fails under a load of 1725 Newtons and a patellar-tendon replacement gives up the ghost at about 2900 Newtons, you will be appalled to learn that a semitendinosis graft substitute for the ACL falls apart at just 1200 Newtons, and the gracilis goes to pieces at a paltry load of only 860 Newtons". So does this mean that if the tendon is reconstructed from the hamstring and gracilis it would have the tensile strength of 1200 (hamstring) plus 860 (gracilis) equaling 2060N and therefore stronger than the original ACL? What is your opinion on the whole strength of grafts issue? 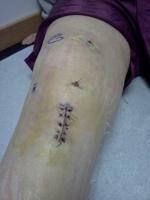 I recently have had an ACL reconstruction and there fore am very interested. 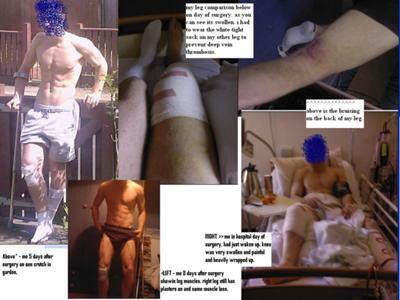 I have created a story on this website detailing my injury.